There’s nothing wrong with the design of the iPhone 6/6s. It’s slim, sleek, stylish. But I never loved it. It was good design, but it never felt to me like great design. 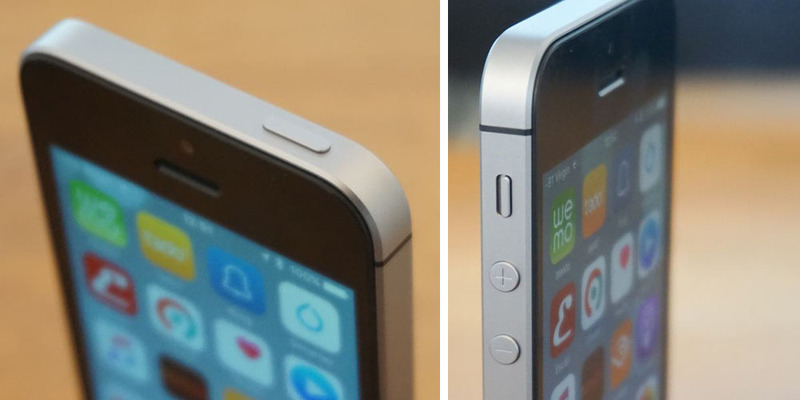 The iPhone 4/4S/5/5S – that was great design. And the iPhone SE is, once more, great design. Non-tech friends will be rolling their eyes right now. “It’s a phone, for wotsit’s sake!” But you all get it, right? I’ve always felt the antenna lines on the iPhone 6/6s looked messy, so it felt great to get back to the old top-and-tail approach. I’ve said before that – for a company which prides itself on details – Apple seems to have absolutely no idea what color Space Gray is. Every gadget it produces has a completely different shade. But on this occasion I was absolutely delighted to see it, because this version of Space Gray looks … silver! 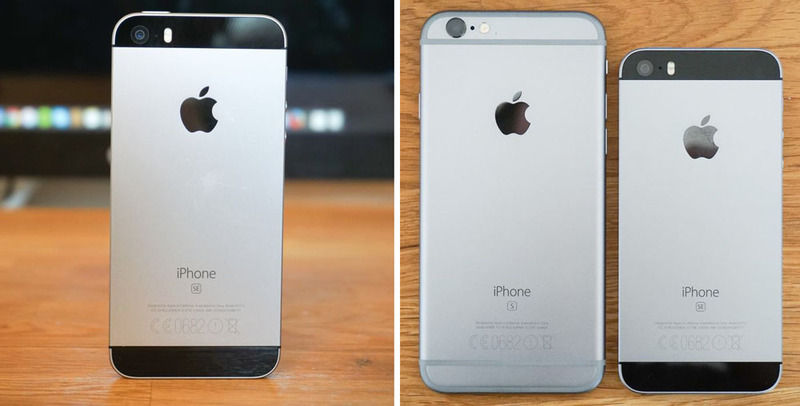 Silver and black has always been my preferred combination, so finally a new iPhone that gives me the look I want. The main visual difference from the 5S is the matte edges instead of polished ones. I actually really liked the polished sides, but I know many disliked the ease with which they got scratched. I thought I might be disappointed by the matte edging on the SE, but it actually looks just as good. Oh, and I always did prefer the round volume buttons. The camera bump on the iPhone 6/6s annoyed many of us, who thought Apple was taking the thinness game just a step too far. The SE looks miles better without it. And it’s really not at the expense of much extra thickness. Sure, the SE is very slightly thicker, but really – an extra 0.5mm is nothing. That last photo does illustrate one usability issue I had, though: I had to get used to the power button being back on the top. I’m very used to having it on the right-hand side, and think that’s actually a better position for it. Of course, form is nothing without function. I may greatly prefer the aesthetics of the SE, but the big question was whether it would pass the usability test. Now that I’m used to that bigger screen, would I find the smaller device fiddly to use? I said last week that I wasn’t expecting the smaller screen to be too big a deal. As I noted then, my (newly upgraded) iPad goes everywhere with me, and my iPhone is actually my least-used device. My iPhone fills the somewhat small gap between things that are convenient to do on my Watch and things that are easier and more pleasant to do on my iPad. When I do use my iPhone, Siri is my primary means of interaction. I dictate messages, have it open apps for me and so on. So that again was another reason to suspect that the smaller screen might not pose a problem. However, theory is one thing and practice is another, so it was only by trying it out that I’d find out whether or not I was right. First up, I wanted to compare how the two phones felt in my hand. The iPhone 6/6s has always felt ok, but as soon as I held the SE it just felt right. Of course, the smaller screen does translate into a missing row of icons on each screen, so four fewer apps. I made a mental note to do some rejigging, but two factors mean that this probably won’t be a huge deal for me. First, the fact that I don’t use hundreds of apps in the first place. Second, my usual way to open an app is to ask Siri to do it for me, or to search for it – so which screen it’s on isn’t really important. Of course, the screen size makes a big difference when it comes to some apps. As Zac noted in his own first impressions piece, you’ll really see the difference in a web browser. But web-browsing on my iPhone is not something I do: my iPad goes everywhere with me, and that’s what I pull out if I need to surf the web. 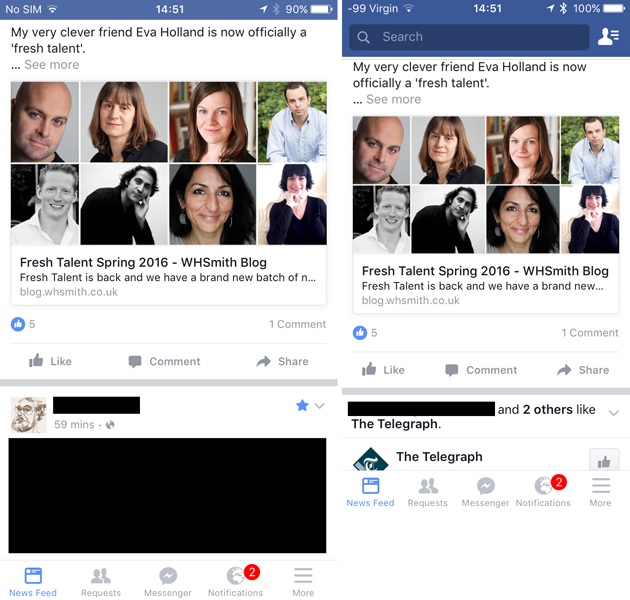 So far, in a very quick test of my main apps, the difference really only makes itself apparent in Facebook, where you do see pretty much one post less on the smaller screen. But again, I use my iPad if I want to do a full catch-up. The only time I use my iPhone for Facebook is to upload a photo or do a quick check while standing on a train platform or similar. So I’m guessing I won’t be too bothered by this, but we’ll have to see. The SE does have the slower, first-gen Touch ID. I was conscious of this the first few times I used it, but it quickly faded from consciousness. I have the same sensor on my iPad, so it’s the same experience on both devices. Speaking of touch, one other difference between the two phones is the lack of 3D Touch support on the smaller model. The feature really impressed me when I first got my 6s, so much so that I even considered it a good enough reason to upgrade from the 6. Yet, as time went by, I found myself using it way less than I’d expected to. I think there are two reasons for that. First, the simple fact of the novelty wearing off. But also the disappointing level of support for it from third-party apps (and even some Apple apps). There were two occasions yesterday when I pressed for it and it wasn’t there: Facebook > Upload photo and Twitter > New tweet. Both times, I just shrugged and opened the app instead. It’s too early to tell whether the lack of 3D Touch will frustrate me, but right now I’m guessing not. I tested the camera against the iPhone 6s and, like Jeff, found the results identical. The FaceTime camera is another matter, of course. I’m really not a selfie guy – I prefer to remain on the other side of the camera – so I haven’t tested this yet. I will. In Jeff’s feature comparison, he pointed to the lower contrast ratio on the SE display. The iPhone 6s has a 1400:1 contrast ratio; the SE offers just 800:1. I wasn’t seeing the difference in everyday use, so I copied over a bunch of hi-res photos to compare the results. 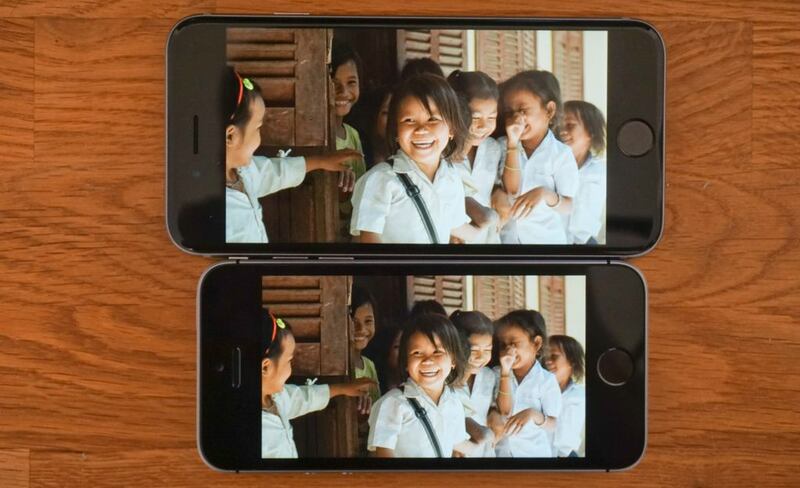 A photo of an iPhone screen isn’t the ideal way to see the difference, but it is a significant one. This was the first spec difference to really give me pause. I flicked through a series of photos and, yes, you can clearly see the difference in every one of them. Plus, of course, photos simply look better on the larger screen. If you want to share photos on your phone, I would say there’s no question at all that you want the 6s/Plus rather than the SE. But again, if I want to share photos, I pull out my iPad, not my phone. So in practice, it doesn’t really have an impact. All the same … I care about image quality, and the comparison between the two did make me flinch slightly. So, where am I at so far? The iPhone SE scores big wins in two key areas: pocketability, and design. I’ve already waxed lyrical about that in the introduction, so I won’t do so again here. It also just feels more comfortable in the hand. That’s partly size, of course, but – paradoxically – I actually find the straight edges of the SE more comfortable than the rounded ones of the 6/6s. Thickness, by the way, is simply not a factor. In real life, the difference between the two is miniscule. There is an obvious difference in real-estate. If I used my iPhone for web-browsing, I wouldn’t be writing this: the SE wouldn’t even be in the running. But mobile browsing is what my LTE iPad is for. So I’m still thinking that the reduced screen real estate isn’t going to prove an issue for me. We’ll see. Touch ID speed is a non-issue for me. The jury is, though, still out on 3D Touch. My view at this stage is I probably won’t miss it once my fingers realize it’s not there, but that one needs more usage to be sure. The contrast ratio of the screen does bug me. It shouldn’t matter, given my usage patterns, but it could prove to be one of those things that annoys me even though it really shouldn’t. Again, let’s see. Have any of our hands-on pieces made the iPhone SE seem more tempting to any of you? Last time we asked the question, 26% of you planned to buy it: 15.6% from an older 4-inch phone, and 10.4% from a larger one. Let’s see if those numbers have changed. Please take our new poll, and as ever share your thoughts with us in the comments.